Further work revealed that the drain below the plinth was blocked. It also revealed the well from which the public water pump in Market Square was supplied. The drain has now been rebuilt. A pipe, probably a gas pipe, was found. 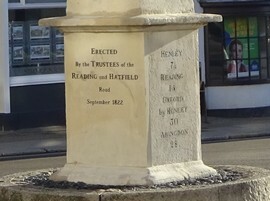 The four faces of the plinth were refaced with a lime mortar mix. The inscriptions were then painted on the face. This technique replaces the original carving of lettering and is the method of restoration approved by English Heritage. The restorers had pictures that we supplied showing the southern and eastern faces of the plinth. They had text of all faces taken from the Milepost Society records. The working hours were 2000h to 0430h. There was a formal unveiling shortly after the restoration was completed. "Well done" to Karen and Charlie Slade of the Company of Artisans who worked through ten nights to complete the cleaning and restoration of the script. In May 2016 MB reported: I began the pressure on Bucks CC in Jul 2012 and today we made the first step on what may just be progress. 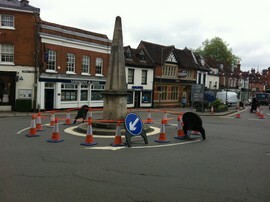 Six men from Bucks came to town today in 2 vans and coned off the obelisk. See the attached picture. They were joined by 2 specialists in conservation, Annie Jones and me. Len Smith said that he would seek funding from his general maintenance budget. Depending on the estimated price of restoration being accepted I sensed that there was a good chance of making progress this year. The objective is more to restore than conserve. The stonework of the obelisk has been patched up over the years with cement so we cannot expect it to be restored to an as new status. Its appearance should reflect its alterations over the years whilst being returned to a good condition that can be sustained with regular attention. The obelisk is constructed of Portland stone topped with some limestone. Repairs in the past were made with cement. The cleaning process, Thermotech, uses hot water to clean the stone. Sandstone absorbs water and draws the dirt but they can deal with that. Portland stone is not absorbent. This means that the end result will have colour variations. The black sulphation will be removed. When the stone facing has been cleaned and stabilised the spalled faces will be made good with hydrated lime mortar. It will then have a shelter coat of coloured lime based paint. The lettering will then be recut once the facing has hardened. A crack in the stone may need pinning. The whole task is expected to take 4 to 5 weeks. To enable the work scaffolding will be required and a safety barrier similar to the one today will be required. Since writing the above brief the debacle of an HGV crossing our bridge made a substantial impact on the plans of Bucks Highways. Resources, both manpower and financial were applied to bringing the bridge back into use. Fortunately, the bridge did not suffer structural damage but the effort to prove this obviously depleted the coffers. 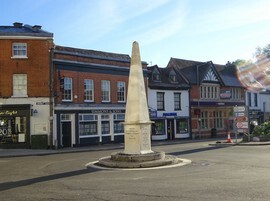 The Marlow Free Press recently advised that the restoration of the obelisk is now scheduled for later this year and our Town Council believes that October is penciled in for the work. Move forward to 16 Oct 17 and a phone call to the engineers at Aylesbury uncovered the news that the restoration of the obelisk had been delayed. The proposed traffic management plan for the restoration would have involved the installation of three way temporary traffic lights with a consequent traffic bottleneck. Plan B, which will proceed in the spring, will result in the removal of the obelisk to a distant workshop. We hope that the refurbishment will include an overall cleaning as well as the restoration of the inscriptions. We are now planning the unveiling ceremony. Dancing around the maypole maybe?